Today’s face: Wenona, inspired by Sktchy. I was so unhappy with my last portrait of Wenona I promised I’d draw her again. I still lost her likeness in this second portrait, but it’s infinitely better than my first attempt. Drawn in a Laloran sketchbook with Micron pens, painted with Zecchi Toscana watercolours and finished on an iPad Pro with an Apple Pencil using the Procreate app. Today’s face: Raquel, inspired by Sktchy. Another work in progress for my Sketchbook Skool Illustration Nation project. 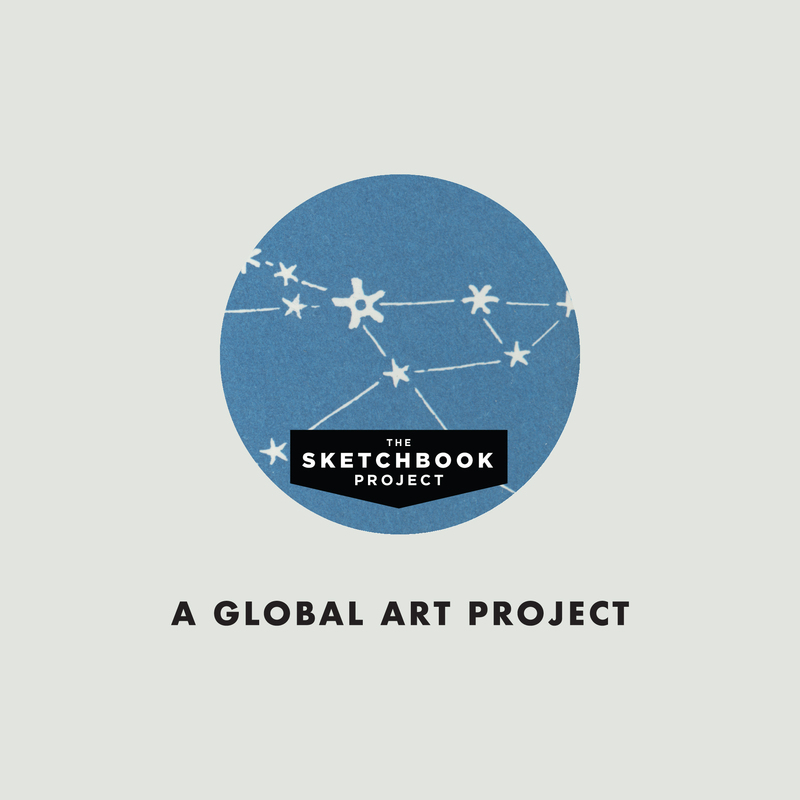 This past week I’ve been taking the first week of Sketchbook Skool’s new kourse Imagining. This week’s klass has been taught by Sketchbook Skool (SBS) founder Koosje Koene. We were encouraged to make a daily drawing from our imagination for 5 days linked in some way, ideally in a concertina sketchbook. A friend had recently given me a triangular shaped concertina Awkward Sketchbook so I used that for this class. Koosje linked her sketches in her demonstrations with a red thread so I copied that idea in mine. I decided to use simple black pen for the rest of my drawing and settled on a rabbit as a main character because I was looking at a ceramic rabbit on the shelf in front of me as I watched the class. Although I was drawing from imagination when I drew the first image it was obvious to me when I finished it that I was very heavily influenced by the work of the artist Jon Carling, whose pen and ink work I adore! When I had completed my 5 drawings I decided to carry on and draw another 3 to fill up my sketchbook. And once I had filled it I went further and turned it into a mini zine using the layout template from Umami Design Studio Blog 1 and the folding guide from Umami Design Studio Blog 2. It’s been a great first week and I can’t wait to see what week 2 brings! Today’s face: Suzan, inspired by Sktchy. Suzan is a staff member at Sketchbook Skool, awesome editor of the Sketchbook Skool blog. Drawing someone you know, even if only online, can be very anxiety-inducing, so this was definitely a tougher draw than many of my more anonymous Sktchy draws and I certainly made Suzan look more fierce than she is in real life! But nevertheless I think I captured her natural beauty quite well. Drawn in a Daler-Rowney Ebony sketchbook with a Micron 01 fineliner and Copic markers. Today&apos;s face: Anniek, inspired by Sktchy. I&apos;m usually reluctant these days to respond to requests on Sktchy to draw someone since I&apos;ve learned from bitter experience that often those making the requests have galleries fully of very blurry photos that I find very difficult to draw from – I will spend a frustrated day trying to draw from a bad photo and the requester will be disappointed with the outcome, so I generally ignore requests. However, when I got a beautifully polite request from Anniek and I had a look at her photo gallery, I was delighted to discover that I had already put several of her photos into my drawing queue! Drawing from this deliciously pink and purple photo was a whole lot of fun! Drawn in a Hannehmühle Nostalgie sketchbook with a Micron 01 pen and Copic markers and edited digitally on an iPad Pro using the Procreate app. 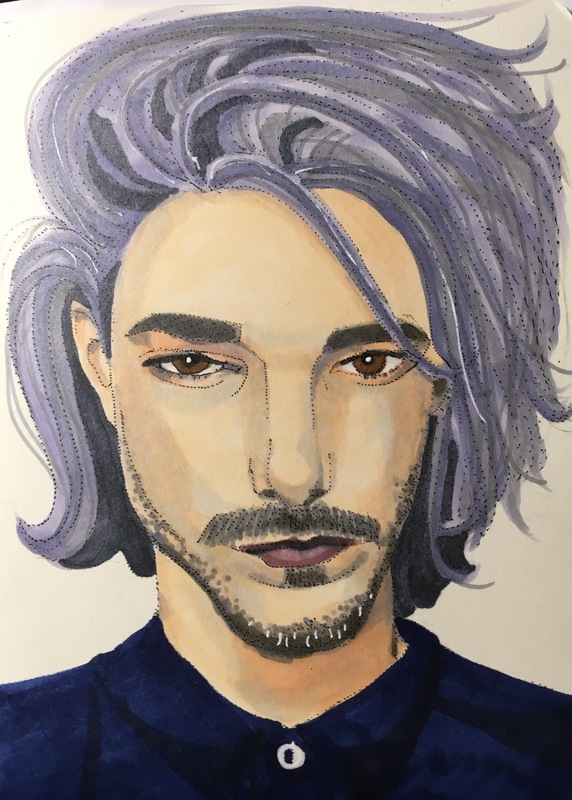 Today’s face: Gustavo, inspired by Sktchy. Drawn in a Moleskine sketchbook with a Cuttlelola dotspen and Copic markers. Today’s Sketchbook Skool A Drawing A Day Challenge prompt is “hair” so I chose to draw this Sktchy photo today because it fulfils the #sbsadrawingaday challenge too!